Surfrider Beach is a world famous wave, a blessing to the surf community, and the image of classic California beach life recognized worldwide. Unfortunately, Surfrider is also one of the state’s most polluted beaches, receiving poor water quality grades every year for nearly two decades. 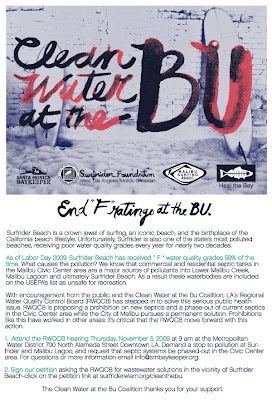 As of Labor Day 2009, Surfrider Beach has received “ F ” water quality grades 59% of the time. What causes the pollution? We know that commercial and residential septic tanks in the Malibu Civic Center area are a major source of pollutants into Lower Malibu Creek, Malibu Lagoon and ultimately Surfrider Beach. As a result these waterbodies are included on the USEPA’s list as unsafe for recreation. With encouragement from the public and the Clean Water at the Bu Coalition (Surfrider WLAM, Heal the Bay, Malibu Surf Association, Santa Monica Baykeepers) LA's Regional Water Quality Control Board (RWQCB) has stepped in to solve this serious public health issue. RWQCB is proposing a prohibition on new septics and a phase-out of current septics in the Civic Center area while the City of Malibu pursues a permanent solution. Prohibitions like this have worked in other areas: it’s critical that the RWQCB move forward with this action. 1. Attend the RWQCB hearing Thursday, November 5, 2009 at 9 am at Metropolitan Water District 700 North Alameda Street Downtown LA.. Demand a stop to pollution at Surfrider and Malibu Lagoon, and request that septic systems be phased-out in the Civic Center area. For questions or more information check surfriderwlam.org/cleanthebu. 3. Forward this email to everyone you know! Help us spread awareness about this historic hearing!